Portable and multi-functional external sound card designed for computer and smartphone network broadcast, online singing, chatting, etc; compatible with most mainstream live-broadcasting platforms, such as YY, Tik Tok and more. Adopts DSP audio chips with strong anti-interference ability and low-noised signal transmission, providing you with excellent sound quality and making your network broadcast more interesting. 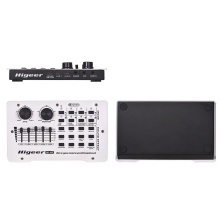 Built-in 8 working modes and 12 special sound effects, one-button selection, quick and easy operation; supports microphone volume, monitor volume, sound mixing(FX), low pitch, middle, high pitch and accompanying music volume(LINE) adjustment. With multiple interfaces, can connect live broadcast mobile phones, accompaniment smartphone/ MP3, computer, microphone and headphone for more professional live video streaming. Compact size with full metal shell, super portable and durable; built-in rechargeable lithium battery and comes with USB charging cable and 3.5mm audio cable for convenient usage.